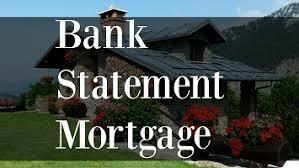 Our bank statement mortgage program is a perfect fit for Self-Employed Borrowers who prefer to use business or personal bank statements to document their income instead of tax returns. To determine monthly income add 24 months consecutive deposits from your personal or business bank statements, take 50% of that amount and divide it by 24. This will equal your monthly income. Insert this figure in the Gross Monthly Income section of the application and make a note under "Other Income" that you used bank statement. All programs are for Self-Employed borrowers, Offered in NYS only.